Coming down through north Norfolk on meandering, narrow lanes through the rolling fields and woods, the tower of St Peter beckoned us from far off, and when we got there we found it all alone. The tree-surrounded graveyard was full of daffodils in full flower. It sits in the fields, half a mile or so from the nearest other buildings, and on this bright spring day there was a birdsong-filled silence that lifted the heart. Far off on the crest of the next rise south we could see the ruined tower of Barningham Winter church in the grounds of Barningham Hall. St Peter is in the care of the Churches Conservation Trust. Although only formally declared redundant in 1969, it had gradually fallen out of use during the course of the 20th century. The Palgrave family, most closely associated with the parish, died out in the 1730s, and the land was bought by the Felbrigg Estate. As Derek Palgrave's excellent guide book noted, by now there were only two inhabitants of North Barningham, and the church was nearly derelict, a state it was to endure until the 1890s. The restoration at this time made it safe and sound, but fortunately did not overwhemingly Victorianise it. But lack of use resulted in a decision in the late 1960s to demolish it, and plough the land under. 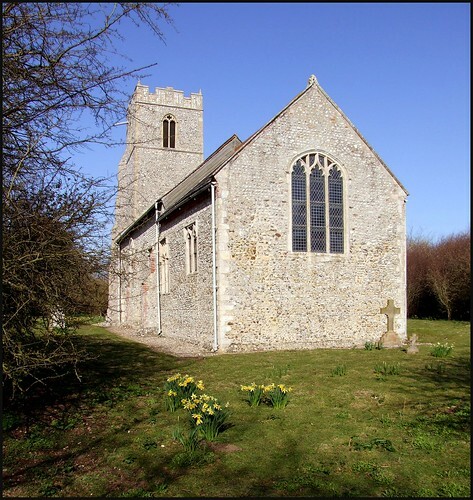 Enter the redoubtable Billa Harrod and the Norfolk Churches Trust, who supported local people to save the building, and, over the course of the next two decades, to make it beautiful again. It became vested in the care of the CCT in 1976. Perhaps it was because we were here on such a beautiful day, but I thought St Peter had one of the loveliest interiors that I had stepped into for ages and ages. The nave is rough and ready, the furnishings slightly ramshackle, the mottled pink of the walls a setting for memorials of jewel-like beauty, and of national importance. The best and most famous of these is in the north aisle. It is to Sir Austin and Dame Elizabeth Palgrave, and dates from the 1630s. The tw remembered gaze out blankly in bust form from within alcoves. Sam Mortlock observed that he is bearded and vaguely quizzical; she will brook no nonsense, which is about right. A lion rampant roars beneath two of his fellow looking out, and whimsical cherubs bear the whole piece upwards. On the floor beneath it are a Palgrave and wife from more than a century earlier, and the other side of the Reformation divide. Sir Henry and Dame Anne Palgrave stand gracefully, him in his armour, and her with a set of rosary beads. Beneath them, their seven children pray for their souls. There are two more splendid memorials up in the chantry, also on the north wall. Margaret Pope was a Palgrave daughter who died in 1624. She kneels stiffly within a curtained chamber which is held open by two angels. There is a very similar memorial at Riddlesworth in south Norfolk, which came originally from Knettishall in Suffolk. Further east is the earliest of these three great treasures, to John Palgrave who died in 1611. His tomb chest bears the figures of Justice, Labour and Peace, perhaps a reminder that he was a lawyer in the Inner Temple in London. Curiously, the three figures have been defaced - did some dull-headed puritan imagine them to be Saints? There is a beautiful double piscina and sedilia on the south side of the chancel opposite the memorials. It is in the full flowering of the Decorated style, a reminder of how English art flourished in the years before the Black Death. It would be all downhill from there. A curiosity that probably comes from half a century later is the ornate wheel picked out in brick and flint in the nave floor. Was it perhaps a decorative feature to surround an earlier font? Or, as has been suggested, did it mark the entrance to a vault? The guide book mentions that the altar furnishings were installed in the 1890s at a cost of £116. This is not far short of £25,000 in today's money. Perhaps this included the cost of the altar rails, which were transferred to nearby Matlaske on redundancy being declared here. In the long term, North Barningham got a good deal, because they have been replaced with the beautiful 17th century set that used to be in St Mary Coslany in Norwich. The benches came from St Peter in Sudbury, which is now filled with horrid plastic chairs. I fear that the Suffolk town's loss is beautiful North Barningham's gain.